As we lay in our tent, trying to fall asleep at 6pm as the sun was setting, we talked about the potential of getting up long before the sun — maybe even 3 or 4 — just to hike by the light of the full moon. Of course this seems reasonable when you’re nowhere near tired and have plenty of time between now and then, but as it goes with camping, we eventually drifted off and sleep came easier as the night wore on. By the time 3am rolled around, emerging from our warm sleeping bags is the last thing we wanted to do. So we stayed where we were until 5, then quietly packed up our tent and began our trek by 5:30. We didn’t admit it, but we were both nervous and maybe dreading what lay before us. 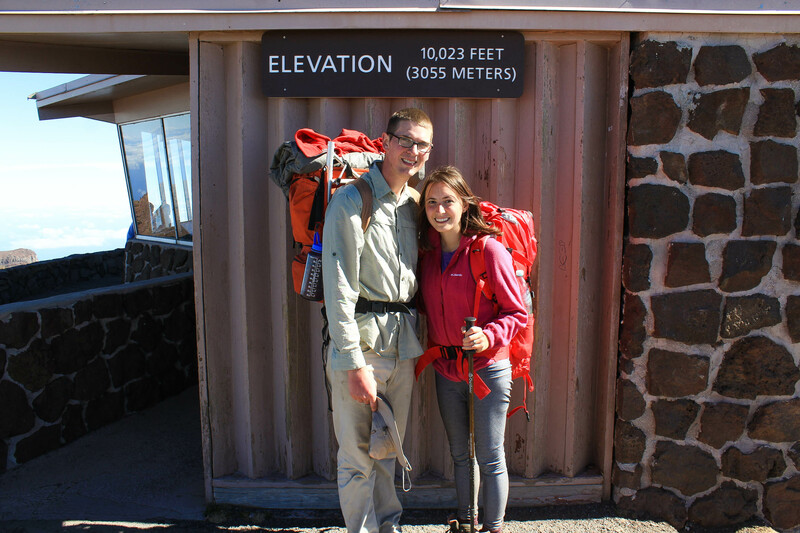 We were sunburned and sore from the day before, and we were concerned about hiking another 10 miles out of the crater, gaining 3500 ft to our highest elevation in years, while carrying our heavy backpacks. Starting before the sun meant less time exposed and in the heat. But that wasn’t the driving factor in the decision to start early. 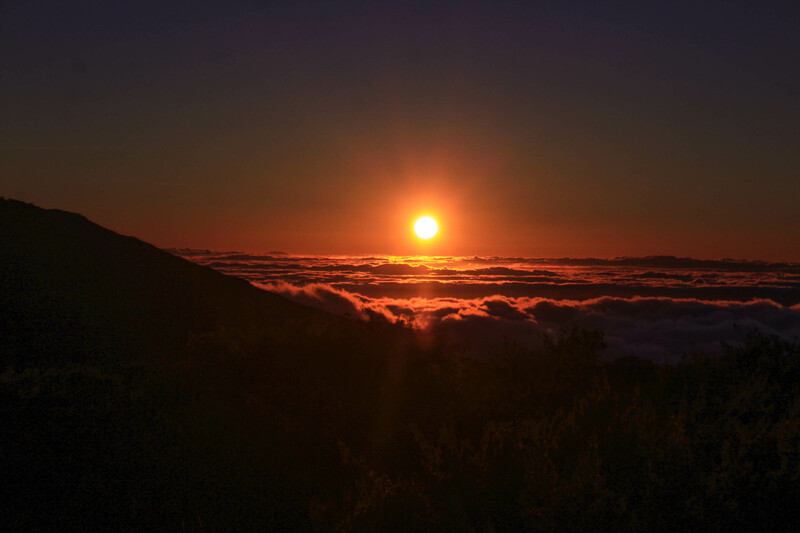 Haleakala is famous for sunsets and sunrises. Every early morning and late afternoon, people make the 38 mile drive up to the summit to witness the glorious sunset from above the clouds. In fact, sunrises here are so popular that you now have to make reservations to drive to the summit weeks or even months in advance. We made our plans much too last minute to obtain such reservations, but we knew we wouldn’t need those: we were looking forward to watching the sunrise from along the trail, all by ourselves. We made our way through the Kaupo Gap, stopping every now and then wondering if where we were would be the best place to observe the sunrise. As it turned out, the trail we were hiking was largely a great area for sunrise viewing and we had no need to search for the perfect spot. Once we left the Halemau’u Trail for the Keonehe’ehe’e Trail (also known as the Sliding Sands Trail) we only had to clear one cinder cone before we had a perfect view of the first light coming over the clouds, with Mauna Kea and Mauna Loa to the side. It was truly everything we could have hoped to see for our one sunrise on Haleakala. 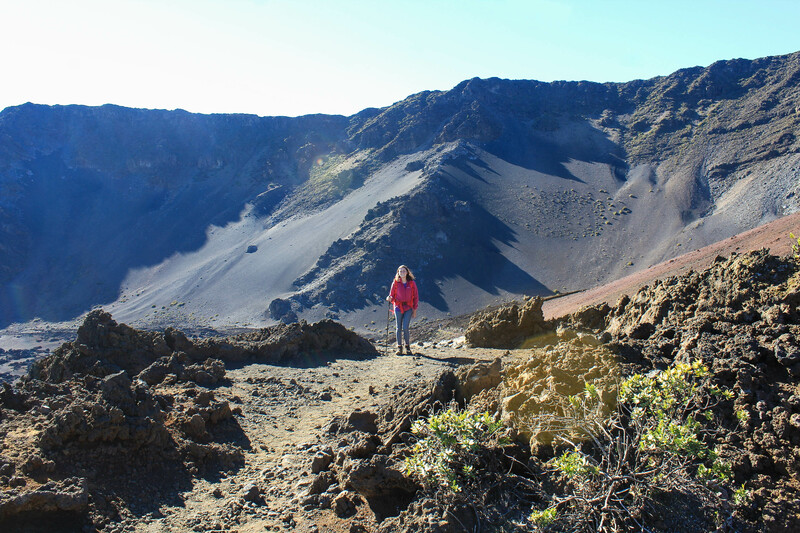 We stopped and ate breakfast, took more pictures than necessary, and watched the crater fill with bright red light. After we were satisfied, we began our long trek West towards the summit. The first 5 miles of the day were easy, consisting mostly of walking straight through the crater on flat ground. The South ridge provided adequate shade for the majority of this stretch, and we were all alone on the trails this early in the morning. Just after 5 miles, the elevation gain really began. However, after worrying about it for so long, we weren’t as concerned as we had been before. The overwhelming emotion I felt was gratitude. I felt so blessed to be here with my husband, and to have this incredible experience to share and remember forever. I also realized that besides the constant elevation gain up the switchbacks, this was honestly an easy hike — easy compared to hikes we’ve been doing on Oahu, up steep and muddy slopes, crossing rivers and relying on ropes to make it up. We didn’t have to watch our footing with every step, the trail was wide and easy to follow. So much of this hike reminded us of hiking on trails in the great Southwest region of the Mainland, and brought back fond memories. Oh how we miss the desert! We stopped frequently in the last couple miles to catch our breath, keep hydrated, and eat cookies. The view over the crater got better and better as we got higher. I know starting from the top and hiking to the lower trailhead is the more popular and easier way to go, but ending at the summit means saving the very best views for last. As we were in the final stretch, I was feeling torn; I wanted to reach the summit, but I also didn’t want this beautiful hike to end. 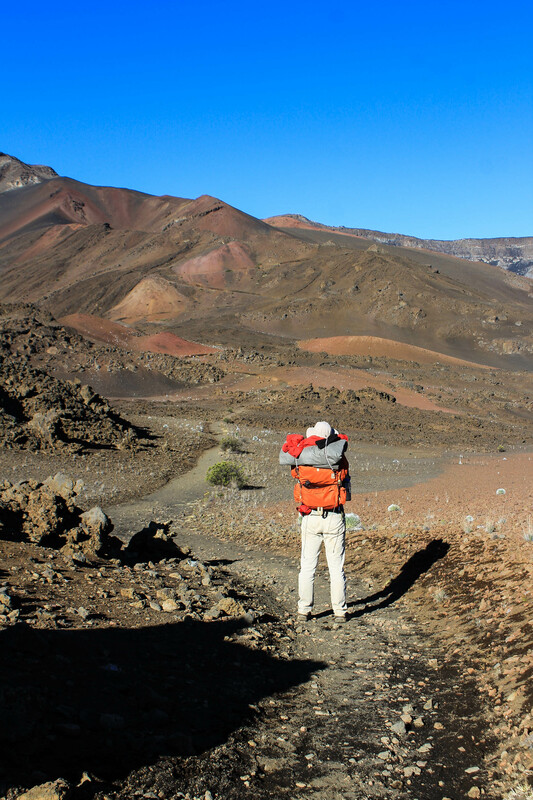 We made it to the end of the Sliding Sands Trail, then walked up the road for the last half mile to the true summit of Haleakala, at 10,023 feet. We arrived shortly after 11, after hiking around 10 miles in under 6 hours (with lots of time spent admiring the sunrise!). The hardest part of it all though was finding a ride back to our car. We walked back down the road to the visitor’s center where we would see the most traffic, and though there were cars constantly coming and going, it took about 20 minutes to hitch a ride. Thankfully a couple from Wisconsin offered to take us to our car and we didn’t have to end up walking all the way down! The national park actually encourages this type of hitchhiking, it keeps them from having the added expense of a shuttle. We decided to pay it forward later by giving a couple different people rides. 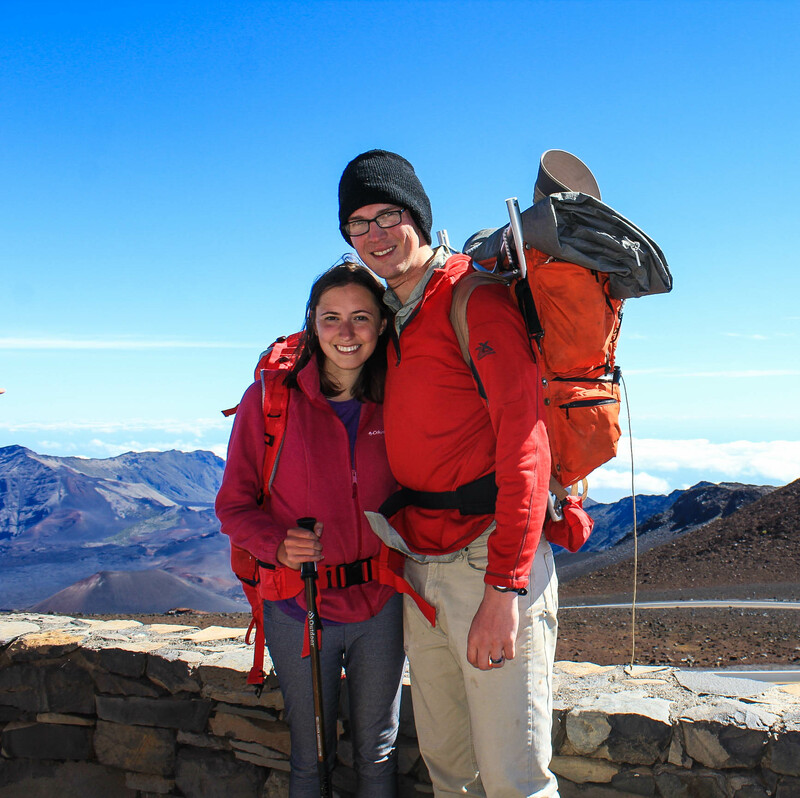 And that was our experience backpacking through Haleakala — it was a most enjoyable one that we’ll never forget, with some of the most incredible and mind-blowing scenery that we’ve ever seen! Come back later to read about the rest of our vacation on Maui!